In fact, as I write, I realise winter has already opened the gate and is sneaking up the garden path. It will soon knock its frosty fingers on the door. Despite the demise of the summer harvests and although there is relatively little happening in terms of growth on the allotment, I have found from my own experience it is a time for other opportunities. The darkness has now crept over the threshold of the working day and this has restricted my ability to garden. It means the weekends are extra special and all other activity aside, no more so than the sunrise. I encourage you to visit your allotment just once to experience the sun climb up from the horizon and drip its soft, golden glow over the plots and all that they contain. It is simply delicious. In the past week, the dahlias gave up the ghost. I walked up to the plot and the sight of their brown stems and blackened leaves actually surprised me. It shouldn’t have because it is November. I’d become so used to them in bloom for what has been an extended season of warmth and sunshine, I really wasn’t expecting it. The dahlias have provided a huge amount of pleasure for me this year. It is the first season I have embraced flowers on the allotment and as Sara Venn recently pointed out to me in a comment on my Instagram, I am indeed completely hooked. Next year the flowers will expand. They will bloom amongst the vegetables and they will have a place to call their very own too. Dahlias yes, sunflowers and marigolds. But others as well. I just need to get my bearings and choose the ones to grow. I’m out of my depth when it comes to flowers and I regret not catching the flower bug sooner but I am excited to play catch up. My determinedness to improve the level of composting on the allotment has paid off. I’ve hardly touched my pile. The odd turn. It’s done well but it’s not ready yet. I can afford to wait. The natural process of composting is gradual. It’s not like making instant coffee. Which is a useful consideration because the truth is it really doesn’t take much work. Manage it a little if you like, but mainly it’s just patience. I’ve written about the importance of reflection when it comes to allotment gardening. Reviewing recent experience enables us to learn from mistakes. However, reflection precedes planning. It is the perfect time to make plans and pick projects for the new season to come. The growing downtime should not instil in us a mindset to leave the allotment alone over the dark seasons. Yes, the amount of daylight means our time on the plot is restricted but it is what we can do in the time we are able to be on the allotment garden that matters. It’s the legwork. The stuff you do in preparation for the spring and all the joy that provides. I have a plan. A series of tasks laid out in order of importance. The daylight and the fickle weather of this time of year might throw me a few obstacles, but starting with a plan and working through it systematically means any time I do get on the plot should be efficiently used. The first is to sow anything I can do right away. I’ve already planted the garlic but before November ends I will sow a few rows of a hardy variety of broad bean. Theoretically, most broad beans are hardy enough to sow in the autumn but some are touted as more preferable than others. This year I’m growing The Sutton. I have a lovely selection of tulips from the wonderful people at Seed Pantry. Last month they invited me to take a look at one of their monthly Grow Club subscription boxes and I am really impressed. The flowers and crops available are all married to the month in which they can be planted or sown and as well as a fantastic choice of what bulbs and seeds you would like in each monthly box, they have an ethos that is right up my street too. The contents are high quality and sustainably sourced and the packaging they use is either bio-degradable, recycled or recyclable. I’ve already planted ‘Paper White’ daffodils which I hope will bloom in time for Christmas and there are ‘Meteor’ peas to be sown on the allotment too. I also have a selection of tulips to pop in pots including: ‘Peppermint Stick’, ‘Spring Green’, ‘Queen of the Night’ and ‘Apricot Beauty’. When the planting is done, then it’s time to turn my attention to repairs, tidying, and constructing new elements on the allotment garden. I’ll start with the existing half which is simply resolving some tears on the polytunnel (hello all weather tape!) before pulling any remaining weeds on the beds and covering them with a few inches of compost. Then the fun really begins. I have the final 30 square feet of the plot to turn from an overgrown mess into a haven of veg, flowers and a very nice shed. I have one last thing I’m excited to share with you. I’ve been planning this since the start of 2018 and it has finally come to fruition. Sharpen Your Spades now has a YouTube Channel and I’m thrilled. If I was going to expand into YouTube there was a number of requirements to fulfil for my own satisfaction. Firstly, it had to be a way that opened up my allotmenting life and to allow you to share my passion and journey even more. Secondly, I had to be able to produce the videos sustainably and without prejudice to my ability to keep writing blog posts. Thirdly, I had a very specific style in which I wanted the videos to look and feel. I’m hugely grateful to my good friend Kevin who has a bit of a talent in filming and editing and he’s made much of this possible. If you enjoyed this blog, I would love if you would share using the buttons below. Congratulations; I really should so something like this. It just is not easy while I must spend so much time at work. Your YouTube video looks great. What made you take the leap? Thanks Ali. It’s something I’ve considered for a while. 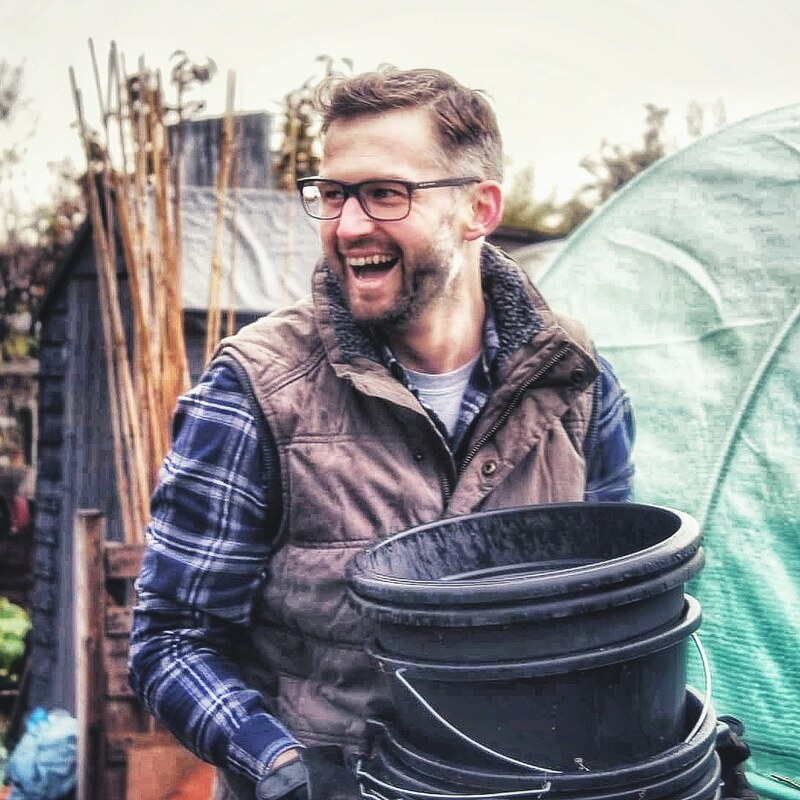 Video does enable you to bring a different form of content and I wanted to do something more to share the allotment gardening. I like watching other people’s videos on YouTube but I had a particular style that I really enjoy watching. It took a while to work it out but with Kevin as my partner on this project I think I have found it. It needs to be a balance as I enjoy writing so much too. But I’m having a lot of fun. Thanks Gwen. That’s very kind. We tend to take videos primarily to remind us of what we were doing and how the plot has looked in the past. My husband and I both have channels which was a mistake really as there are some videos that we want to share on both as we have different subscribers. It would be great if there was an easy way to merge them. We’re fortunate in being retired so all our digging etc is done and now we can look to the extras. We have visited the plot early a few times mainly for radio pieces but never had the golden glow. The first time it was murk and mist.